Bennewart Flex Tester is intended to determine the resistance of a component of material to cut growth during repeated flexing. It can also be used to assess the effect of surface patterns on crack initiation and growth. This test is especially applicable to the outsoles of footwear, but may also be used with certain other flexible components.The Bennewart Flex Tester consists of a drive unit comprising an electric motor with pulleys and belts and link mechanism to give an oscillating movement to one of the two grips holding the two ends of the test specimen, the other grip being fixed.The oscillating grip has gun metal bushes, which slides on two hardened and ground bearing steel rods to give it a long working life. Each grip consists of swayable bases pivoted on ball bearings so that the two ends of the test specimen are free to align themselves with the natural contour of the specimen during flexing. The axis about which the grip bases oscillate life. A six digit pre-set electronic digital counter the numbers of test cycles and also stops the motor after pre-set numbers of test cycles. The apparatus is finished in gray hammer tone shaving, painting, and bright chrome/ zinc plating to give it a corrosion resistant finish. 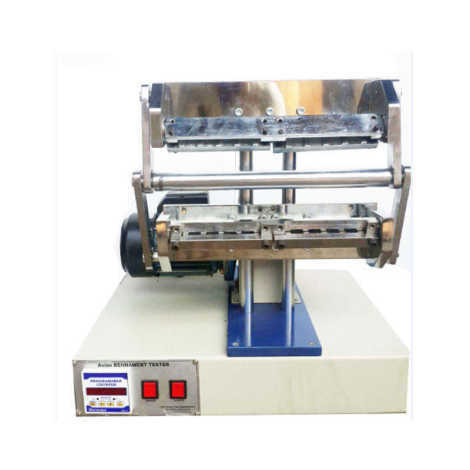 A cutting dies for the preparation of test specimen from the sheet and sitting punch with a jig for making initial crack are available as optional accessories.